Annual Spring Business Conference, "Women in the C-Suite"
The Spring Business Conference is BOW's signature annual event that invites recognized business leaders in various industries from around the world to address the Duke community and beyond. 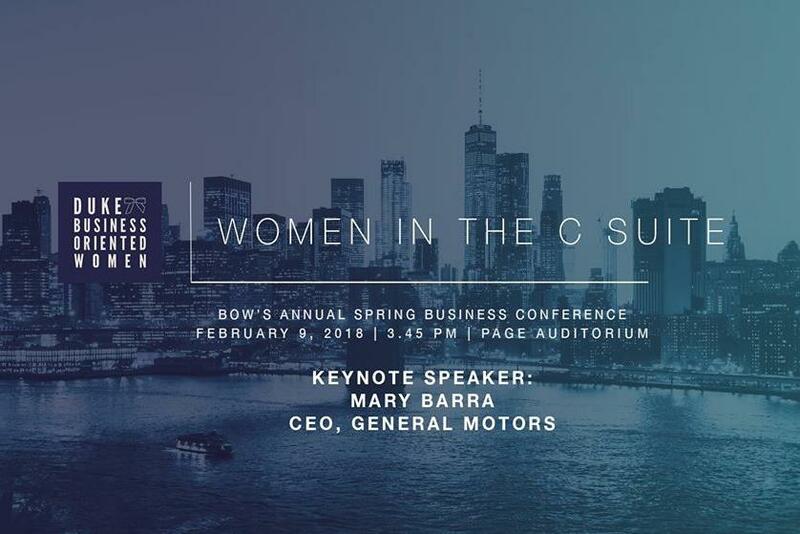 Our theme this year is "Women in the C Suite," and our speakers include CEO and Chairman of General Motors, Mary Barra, CEO of Art.com, Kira Wampler, and a panel of women executives in startups. The panel features Pamela Hawley, CEO of Universal Giving, Hannah Sieber, COO of EcoFlow Tech, Ivonna Dumanyan, CEO of Fathom AI, and Amanda Freeman, CEO of SLT. We are expecting 400 participants from over 20 organizations and universities, and we would be delighted to have as many Duke students there as possible. It will be a great evening of professional development and networking with some of the Triangle's most distinguished students and professionals. There will be company recruiters present after the conference.